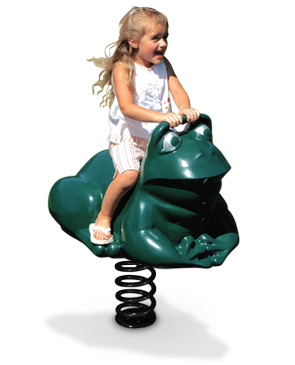 Kids cannot stroll past the frog spring rider without hopping on for a ride. This friendly frog is mounted on a heavy-duty, black powder-coated spring that can be surface mounted to concrete with J-bolts. Manufactured and tested in accordance with ASTM standards. Available in colors as shown only. The frog rider spring is powder-coated with a triple flo-coated corrosion protection for a superior, high gloss, no peel, no flake finish. 3/8" Thick Rotational Molded Plastic Body. 14' x 15' Use Zone.